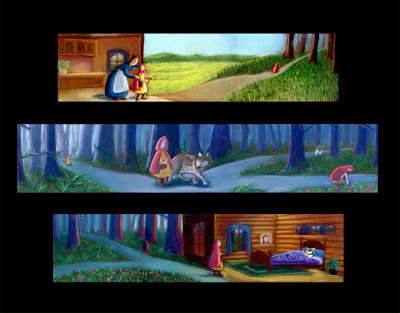 These are color keys that I created based on the story Little Red Riding Hood. I really wanted to explore color and create mood. It was really frightening initially making the trees purple/blue, but I just kept going and it turned out better than I thought. I really think I am starting to understand color and color relationships better. Click to see the images larger.